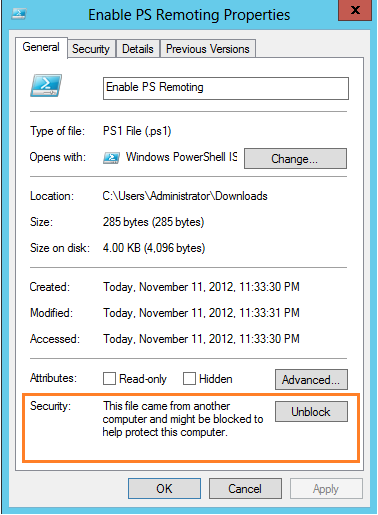 You might have encountered some situations like when we download a file from the internet we would not able to run it until we unblock that file in its downloaded file properties.Here’s an example of a file I downloaded from internet, even though I have my PowerShell Sessions Execution policy set to “Remote Signed” it would still fail to load the script and I would need to manually access the file properties and unblock that file. It Helps in unblocking files which are downloaded from internet. By default, these files are blocked to protect the computer from untrusted files which might contain spyware etc. Internally, the Unblock-File cmdlet removes the Zone.Identifier property to indicate that it was downloaded from the Internet. Now let me Unblock the file using Unblock-File and rerun Get-Item with stream property.